Pecans (Carya illinoesensis) are large, stately trees that produce a delectable nut. They also make superb shade trees for yards that are big enough to support them. Pecans are native to the Southeast and Midwest portions of the country where they are typically found on flat fertile land in valley bottoms. They thrive in moist, humid conditions and need a long hot growing season to produce good quality nuts. They are capable of reaching 70 feet or more in height and almost as wide. The leaves are arranged in long clusters comprised of nine to 15 oval-shaped leaflets. Flowers appear in as elongated catkins in spring, but are not particularly showy. They are followed by 2-inch husks in fall containing the nuts. The trees are hardy in USDA zones 6 to 10. Pecans may be planted from pots in spring or fall, or as bare root specimens in late winter. They need a location in full sun with rich soil. Spreading several inches of compost across the planting area and tilling it in prior to planting will help get them off to a good start. Keep in mind when planting pecans that two different varieties must cross-pollinate each other to produce nuts. A pair of pecan trees takes up a lot of space when mature and it's notoriously difficult to grow other plants in the shade beneath them, as their root systems are very aggressive. Avoid planting them where they will hang over paved areas because the roots may damage the paving and the nuts can stain the surfaces beneath them. In the landscape, they could be considered a focal point. Shade trees like pecans are generally planted in a large open, sunny area. 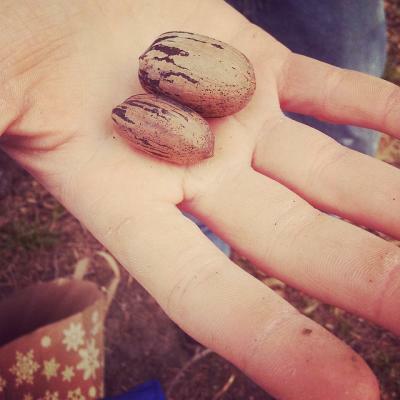 Water pecans deeply every two weeks during the growing season until they are well established. Even mature pecans need a deep soaking every month or so if there has not been substantial rainfall. A fresh layer of mulch each spring also helps to build organic matter and reduce moisture loss. Spreading a layer of compost over the root zone each fall is an effective technique for maintaining soil fertility. Fertilizer is not necessary for trees growing in rich soil, but it may increase the nut crop. A balanced all-purpose fertilizer, such as 10-10-10, is suitable for pecan trees. 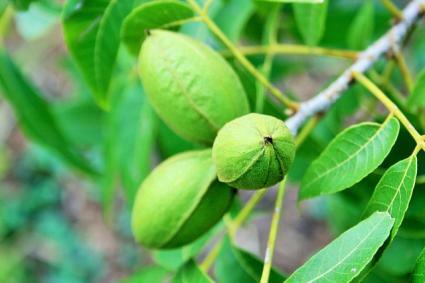 Remove any 'suckers' that sprout from the base of pecan trees, as well as any dead or diseased wood. No other pruning is typically required, as pecan trees take on an attractive shape on their own as they grow. Pecans are susceptible to a number of pests and diseases, including cotton root rot, aphids, webworms, powdery mildew, anthracnose, leaf spot and many others. Pecan weevils, which leave tiny holes in the shell of the pecan and eat the nut meat, are one of the most prevalent pests. Summer sprays of Sevin (carbaryl) on the ground around the trees are an effective form of control. Pecan scab is one of the most common fungal diseases, causing black spots all over the leaves and husks. Fungicides can help with pecan scab, but they are difficult to administer on such large trees. If you have a serious outbreak of scab or other fungal diseases, a licensed arborist can bring special equipment to spray the entire tree. Zinc deficiency is another common problem in pecan trees. Zinc-deficient trees can be identified by mottled, discolored foliage, early leaf drop, dead twigs, and twigs with clusters of what appear as dimunitive, yellowish leaves growing from the tip. As a remedy, apply zinc sulfate. Pecans are ready to harvest when they fall to the ground, though you can try knocking the limbs with a large stick to encourage them to drop. Pick them up by hand or use one of the pecan-gathering tools designed for the purpose. Then it is simply a matter of cracking them open, discarding the shells and enjoying. Refrigerate or freeze them in an airtight container for long term storage. Pecans are widely available at garden centers in the parts of the country where they are most suited. In other regions, consider ordering from a mail order supplier. The different varieties are generally identical in appearance, but have been bred for disease resistance, ripening time, and other factors. 'Pawnee' is a disease resistant variety that ripens in mid to late October. 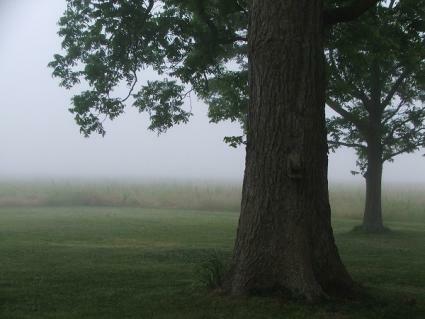 It is hardy in USDA zones 6 to 9. 'Colby' ripens in late September and early October and is known for its thin, easy-to-crack shells and early bearing. Plant it in USDA zones 5 to 9 for best results. 'Peruque' is a highly productive variety that ripens in mid-September and is known for being resistant to pecan scab. It's hardy in USDA zones 5 to 8. Pecans are too big for small yards, but in the right setting there are few trees that make such a majestic shade tree. The limbs are wide and spreading -- perfect for hanging a swing -- and produce a tasty nut crop if conditions are right.